Volunteer run, tool resale shop that helps seniors in need through the Umbrella of Colonie home maintenance program. 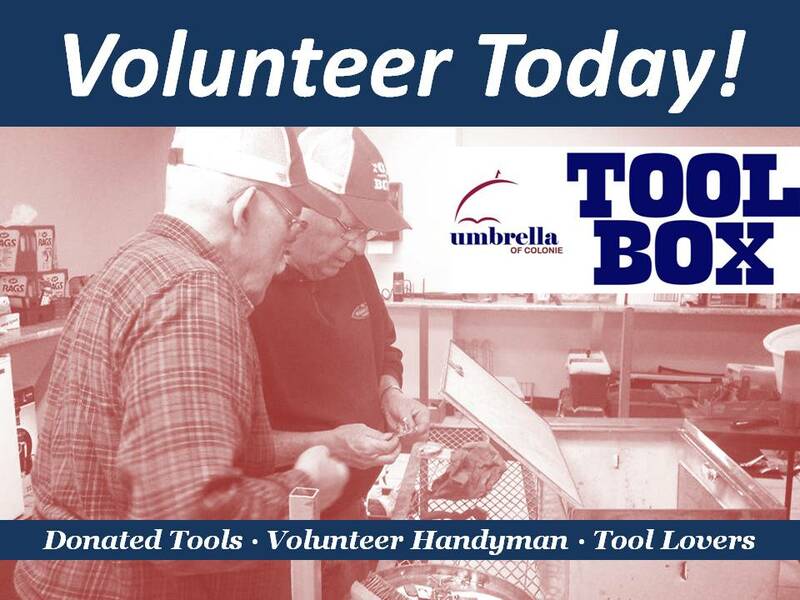 In October 2015, Umbrella expanded its services by creating the “Tool Box,” a volunteer run, donation based tool resale shop that serves as a place for people to donate tools and a gathering place for Umbrella handy people and other tool lovers in the community. All funds raised from the Tool Box support members of the Umbrella program who need help, but may not be able to afford it. The Tool Box continues to grow and consists of volunteers who are dedicated and conscientious, working hard day in and day out. The Tool Box provides an opportunity to donate tools that are no longer used or needed, knowing that they will be enjoyed by another tool lover and that the proceeds will help our community. The program creates lasting friendships between volunteers and the building becomes an ideal gathering place for volunteers and shoppers to connect and share their love of tools. The Tool Box also serves as the perfect place for Umbrella to hold its quarterly Handy People Breakfasts and other get-togethers to build the feeling of community. The Tool Box is conveniently located at 143 Troy Schenectady Road, Watervliet, NY 12189 (Town of Colonie). Stop by soon!